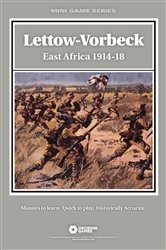 Lettow-Vorbeck is a game covering the East African campaign of 1914-18. One player controls the Allied units and tries to clear German East Africa. The other player controls the Germans and tries to prevent it, or failing that, to grab a source of supply in one of the surrounding Allied colonies. The Germans historically eked out a win by grabbing a supply source in the British colony of Northern Rhodesia even though they had been chased out of their home colony. Lettow-Vorbeck uses the Hand of Destiny series rules. Each player has a unique set of campaign cards generating movement, combat bonuses, historical events, and reinforcements. Playing the right card at the right time lets one side concentrate the forces needed to win that great victory against all odds, or perhaps go down to inglorious defeat. Combat is resolved using a quasi-tactical procedure in which units take turns firing at one another.